The Wil-Flex diaphragms are made of food-grade Wil-Flex (Santoprene) and do not incorporate an outer metallic plate that requires the pump to be cleaned manually – the metallic plate is integral to the flexing material. They feature a large integral piston and longer rubber/TPE shaft that enables it to maintain the same stroke length as traditional Wilden diaphragms. The diaphragm’s full-stroke design increases product displacement per stroke. 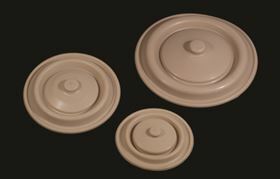 Wilden’s Wil-Flex diaphragms do not require inverting of the diaphragm for installation. Since the diaphragms are not a laminate they do not require the use of any chemical adhesives, making them compatible with all products and compliant with US Food and Drug Administration regulations. In the event of a failed diaphragm, the pumped media will only be exposed to food-grade plastic or stainless steel. Their clean-in-place capabilities also guarantee the Hygienic Series pumps compliance with EHEDG and 3A regulations. They can also be used to unload thick materials from totes, and large-particulate handling in various food-production applications, such as pumping stews, soups, sauces and cheese curds.